Provide the exact interface that you need to integrate into your environment including: command Line Interface, DLL/API, GUI, LabVIEW, etc. Provide one device that replaces several cables in your test fixture for improved throughput and convenience. Provide a faster, more reliable replacement for the programmer provided by the chip manufacturer. Integrate into popular ICT systems. Include Boundary SCAN, Functional test or embedded tests as a complete program and test solution. To get started we just need a specification for what you would like to do. After reviewing your spec, we will come back to you with a fixed price and delivery schedule. To learn what we can create for you, give us a call on 1-800-928-6038 or use our handy contact form. NAND and NOR FLASH and SIM Modules and Devices from – AMD, Spansion, Samsung, intel, Atmel, Spansion, Fujitsu, Micron Technologies, NEC, Sharp, Toshiba, ST Microelectronics and Silicon Storage and others. Processor Based Programming – Using the processor on the UUT to do FLASH Programming for example. FPGA to FLASH Programming – Using an FPGA on your board to program your nonvolatile device. To discuss your unique needs give us a call on 1-800-928-6038 or use our handy contact form. 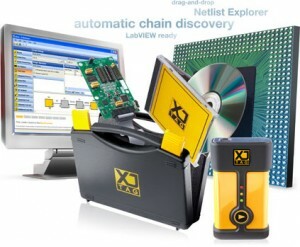 USB Based single TAP XJLINK (JTAG port) or 4 TAP XJLINK2 for fast, yet portable performance in the lab or on the road. Rack based PXI JTAG controllers. Add in Cards for the Agilent 3070 In-Circuit Tester. We can also support an optional hardware accelerator card for maximum programming performance. We provide both GUI and programmatic interfaces for device programming, allowing you to chose the best tool for your unique needs. We support all industry standard file and device programming formats, in addition you can use our test development language, XJEase, to write support for custom formats as well. Copyright text 2015 by Etoolsmiths.